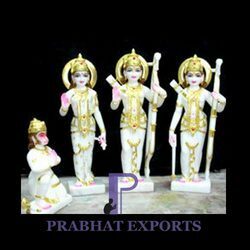 Banking on our vast experience, we are indulged in manufacturing, supplying and exporting optimum quality Marble Ram Darbar Statue. These statues are precisely fabricated from best grade marbles and highly demanded for their requisite designing, extra shine and perfect finish. 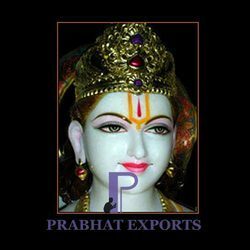 Our offered range comprises of Ram Darbar Statues, Marble Ram Darbar Statues, Marble Ram Darbar Statue with Das Hanuman and Rama Statue. We have in store with us Ram Darbar Statues in attractive colours and alluring patterns. These intricately carved and designed statues depicts three idols of Lord Rama, Goddess Sita along with Laxman. Our range is manufactured from high grade marbles and painted with alluring colours to provide an appealing look to the devotees. 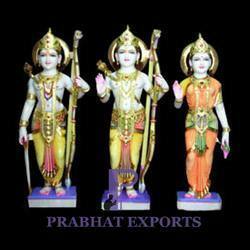 Clients can avail these Ram Darbar Statues in numerous sizes and quality grades at most affordable pieces. 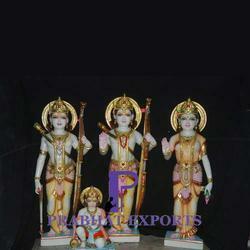 Our offered range of Marble Ram Darbar Statues evokes a spiritual feel to the devotees. These statues are beautifully designed by the master craftsmen in alluring designs and patterns utilising high quality marbles and stones. Our well polished range has smooth surfaces and reflects the innovative skills of the expert craftsmen. Clients can avail this range in desired sizes and shapes at market leading prices from us. Driven with perfection, our firm is catering the customers with an unmatchable spectrum of Ram Darbar and Hanuman Statue. These well designed statues depicts ten figures of beautifully painted lord Hanuman. All the statues are placed upon a marble platform to provide firm support. We have painted the weapons and ornaments of lord Hanuman with bright golden colour to provide a mesmerising look to the devotees. We have in store with us impeccable and beautifully carved Rama Statue. This marble made statute depicts the figure of lord Rama with relaxed and pleasing smile on the face. Our experts have taken special care in detailing the expressions and features of of the face by making use of eye catching colours. Clients can avail this range in desired sizes at most competitive prices from us.